Electronic Arts' Need for Speed series continues to lead the exotic car-racing pack in its latest incarnation, Need for Speed: High Stakes. Though graphically similar to the previous version (Need for Speed III), High Stakes innovates with new race tracks, visible car damage, and a career mode that should please racing fans. Diverse play modes separate Need for Speed: High Stakes from standard driving computer games. Though single races and tournaments across several tracks are readily available, players can also participate in the inventive Hot Pursuit mode, where you flee from police or try to catch speeders, as well as a career game. In the career game, drivers begin with enough cash to buy a low-end sports car. Prize money earned in races can be spent on repairs, performance upgrades, or a hotter car. High Stakes contains over twenty exotic cars, including the BMW Z3, Lamborghini Diablo SV, Porsche 911 Turbo, and Ferrari F50. Additional dream machines are available at Electronic Arts' Web site. If you don't have the patience to save up for a new car, you can choose the ultimate high stakes race: winner takes all, including the opponent's car. 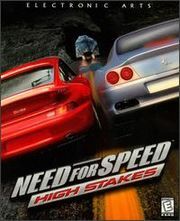 With cutting-edge graphics and sound, Need for Speed: High Stakes reigned as the leader in arcade racing. Need for Speed: High Stakes's polished gameplay, sleek design, and plentiful play options will keep you on the open road for quite awhile.